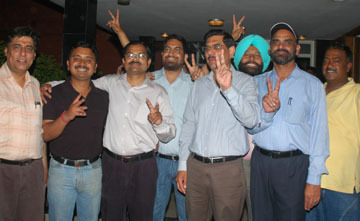 Jorawer Singh, Chandigarh, March 28, 2010: Naveen S. Garewal Panel has won the Chandigarh Press Club Annual Elections 2010 by capturing all the 9 posts right from the President to the Treasurer. In the day- long battle against the Rajesh Deol Panel, Naveen Garewal himself defeated Rajesh Deol by a margin of 98 votes. Ms. Nanki Hans stood 2nd getting 113 votes.